Islay single malt whisky Smokehead has unveiled an ‘intense’ new expression alongside a ‘bold’ makeover. Smokehead High Voltage is a no-age-statement malt bottled at 58% abv with liquid sourced from an unnamed Islay distillery. The expression is a permanent addition to the range that will sit alongside the original Smokehead. It’s described as having notes of ‘intense peat and smoke, porridge oats, clean vanilla and toffee’. 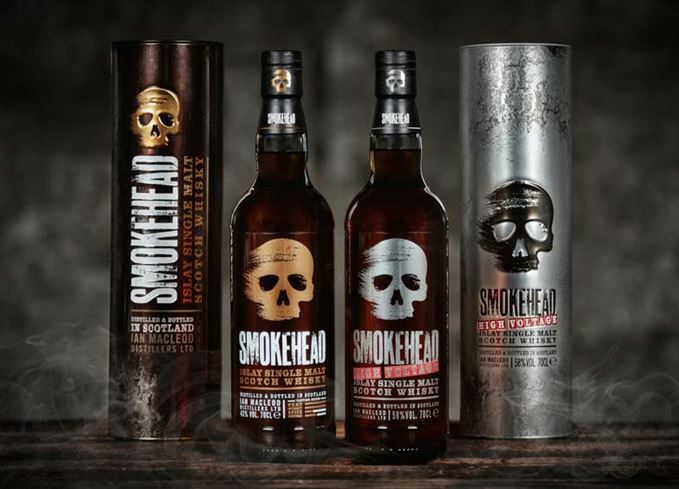 The redesigned packaging places Smokehead’s skull logo more prominently on both labels and gift tins in an effort to appeal to millennial drinkers. ‘Smokehead has always challenged the traditional whisky world with its unconventional look and attitude, appealing to the younger and adventurous whisky drinker,’ said Weir. Despite the new look, the liquid in the existing core Smokehead expression, an eponymous peated single malt botted at 43% abv, remains unchanged. Both Smokehead and Smokehead High Voltage will available through specialist shops worldwide, priced at £38.99 and £54.99 respectively.